But for this week! it was crazy! And hot. But let's start with the miracles! Saturday night. We needed new investigators and were talking with a lot of people, but no one wanted to talk to us. That I think is the saddest thing. But no one wanted to talk to us and we were crossing a bridge talking about something. I don't remember what. Then this lady stopped us and started talking to us about how faith in her life has helped her and she was Catholic, but she didn't like how they used images. So she is no longer Catholic. Her name is Maria. So Sunday we went to look for her. And we got the wrong house. And the lady that answered the door started talking to us about how she doesn't have a lot of time to talk because her husband is inside. So we just told her that we are missionaries and we are here to help people come closer to our savior Jesus Christ. And she told us that she hasn't been able to go to church because her husband cannot leave the house. So we asked if we could say a prayer with her. And she invited us in the house to pray with her husband. This is the story about Marina. 3 Months ago her husband 76 years old had a stroke. And now he needs help doing things that normally would be easy. He has no control over one of his arms. He was sleeping, but we said a prayer with him and Marina started crying and told us how grateful she was for the prayer. My companion bore her testimony about the resurrection and how all of us will be perfect after the resurrection. I read a scripture in alma about Jesus Christ suffered all of our sorrows and because he did this, he know exactly how he can help us. Then she started crying again and invited us to come back. I know that it was a miracle to meet Maria on the bridge. But I think the greater miracle was that through Maria we were able to meet Marina. Marcos and Graça: Well I hope you remember them. And unfortunately, they are still investigators. We tried 3 TIMES! last Sunday Marcos had to work. Pronto. Graça was ready, but Marcos was at work. Then we tried Wednesday night. And when we came to their house Marcos had locked himself in his room and turned off the light. WHAT? So we sat in their living room and waited. FOR AN HOUR! And Fabio (investigator and cousin of Marcos) was there with us asking questions about the gospel. Specifically about Melquesidek. We were answering his questions, but it was cooler to watch Graça who is not a member answer the questions that he had. And when she didn't know the answer she would ask us. But after an hour of this Marcos came out of the room and started bearing his testimony of the Book of Mormon. How he knows that is it true. And that he knows that Joseph Smith is a prophet. And he wants to be baptized but that he just needed to sleep (cough) And then he started talking about how this is not the church of the ´´Mormons´´ that this is the CHURCH OF JESUS CHRIST OF LATTER-DAY SAINTS. And he wants to buy a t-shirt and write the name of the church on it so that he can get people to stop calling it the church of the Mormons. He is legit. But he was not baptized this Sunday...soooooo....I don't know when he will, But I KNOW that he will. And Graça was telling me that because I am here in Brazil, she knows that this church is true. Because we have young men and women ages 18 to 25 here. and she always tells people that I left my GRANDE CASA with my GRANDE breakfast and my GRANDE car and my GRANDE life (even tho I tell her every time it wasn't that great...but now we are going to have an American breakfast one of these days! And I will make pancakes and eggs and hashbrowns. But I am sad we don't have butter. Or buttermilk because I would totally make grandma T buttermilk pancakes...but they don't have buttermilk here) to live here in Brazil and get eaten alive by mosquitos and burnt by the sun all sweaty and gross. But she asked why would someone do this if it wasn't true. If they did not believe 150% that this is the true Gospel. And I have to say that it is true. This is the true church and that is why we are here. Sweating. Eating strange food. Sleeping in ghetto houses. Wearing strange clothes in a strange land. Speaking a strange language that NO ONE understands me! Because I know that this is the true gospel. 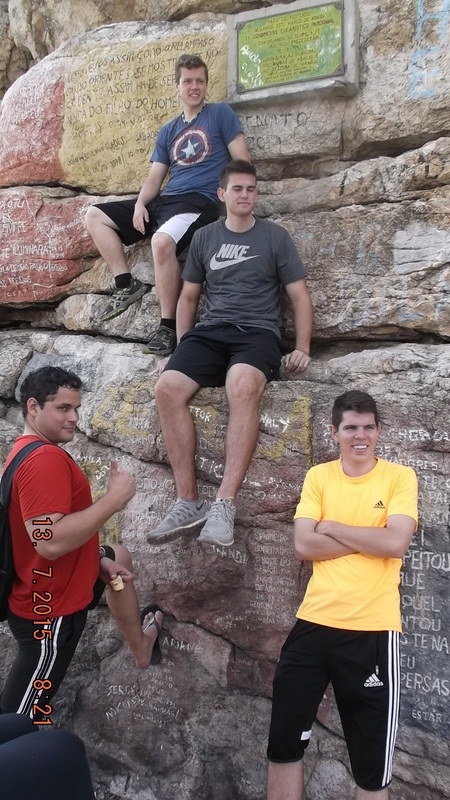 That I am helping people here In Canguaratama know their Savior and helping them find the path that will lead to eternal life with our heavenly Father. Because it is true. Eu sei Que Estas coisas são verdadeira! Fabio: You remember him from the house of Marcos and Graça. Great this is the same, Fabio. The same one that has been at the church for 2 months but has trouble with the Book of Mormon. Because he doesn't think that Moroni could be an Angel and a prophet in the Book of Mormon. He was an evangelist for 2 years and he studied the bible A LOT! And man talking to him sure has been a testimony builder for me because he will ask questions that are really strange and I have never studied in my life. But I will be able to have an answer for him. And not only an answer but I will be able to say it in Portuguese. This is a miracle, my friends. It is a GREAT miracle because he asked weird questions. I think I will write a book of all of the questions that he asks me. But the coolest thing is that we were at his house and a member with just 7 months walked past and was talking with us and he BORE his testimony to FABIO! About the church about how it has helped him in his like. Helped his family. And that it is the true church. Fabio has lots of people that are bearing testimony, but I don't think he is hearing them. But the one thing that he keeps asking is for people to pray for him because his faith is weak. He is weak and needs strength. So we are praying for him because he is a good kid. But he just needs to start using the faith that he has and it will start to grow. Janaina and Daniel: I don't know if you remember them, but their mom is a witch. Not in a bad way...well I guess it is a bad way. But you know the movie harry potter when he opens the letter and Hagrid says ´´Harry you're a wizzard´´ Well it's that kind of witch. (I don't know where that came from because I don't like Harry Potter) But the mom does not like us. Probably because she is doing work of the DEVIL and we are doing work of JESUS CHRIST! But she (remember that we are talking about the mother) Glues Janainas Book of Mormon shut. How childish! And when we went to pick up her son he is 19 years old and a member she wouldn't wake him up because she doesn't want him going to church. But we won't give up because Daniel and Janaina need this goodness in their lives. Their parents don't do anything for them. Their mom tells them that they are not worth anything. How sad is that! It is horribly sad. But we are working with her. And she wrote the cutest little note in my planner about how we are friends for life and she thanked me for helping her know that she is a daughter of God. And that he loves her and she has a role in this life. We have a less active return missionary in our area. And we stopped by his house and he told us that he no longer believes in God. Welp...that just goes to show you that the adversary is always working with every one of us. And we have to remember that. Last week we had a recent convert ask if we could bring a declaration to the President that said he wants his records removed. And we told him that if he wants this then he has to go and deliver it himself. So last week he went to church and I don't know if he gave the declaration back to the president but He was at church this Sunday for all three hours and asked us to come back to his house. And last thing. We tried to take a shortcut this week through the trees. And it was just like a movie. The deeper into the forest of palm trees the bigger the insects get. There was an ant as big as my thumb. And then one with a BIG head and pinchers that you could physically see. they were huge. I just wish I had my camera.....hopefully next week! Thank you so much for everything you guys are doing! All the prayers and support! Love you and l miss you a lot! Well I don't have a lot of time. I waited 30 mins for the site to load...MY LIFE! Portuguese is a lot easier now even tho I still talk with errors. But I think English is a little bit harder. There is a group of RMs here that want me to teach them English. So I will do my best. They already know a little bit so that is good. Any tips on how to teach English? haha! I found a member that will take my camera to Natal and get it fixed...I am just hoping that it is not too expensive. But then I can start sending pictures again! Figured out a little more about Janaina and the witchcraft. Her mom is creepy but her dad is all for the church. So that is good. Will help her a lot. Fabio...he is complicated. He does not want to pray. So we talk to him and he has a lot of really good questions but he won't pray about it...so that makes receiving a response a little hard. But we are going to give him some space to decide if he wants to keep listing to us...but he is pretty cool. And I think the coolest part are the members here. They are cool! For real! Neta is always giving us BOLO! CAKE! And they like speaking English! AHH! Well, I was transferred this week and I don't know if that was a good thing! I love my new area and all of the people here. But there are some things I miss. Like my old area was colder than this. And I lived with 4 people. And there were not as many mosquitos! I am dying of mosquitos! There are SO MANY! I was in the house of an investigator and the whole wall was full of mosquitos. NOSSA! But here is a summary of my week. Don't really have enough time or space to write it all. It was like 4 weeks in one. The first part was in Currais Novos. We got our calls for transfers. And we had to wait until 7 pm at night. So the whole day we were all nervous about who would get transferred and who would stay. ON TOP OF THAT we would have to pack and be out of the house the next morning by 5. So my area there closed and me and Sister Castilho were both transferred. Sister Castilho is now a sister training leader in Sousa (that's 2 for 2) And I was transferred to Canguaratama. Zona Pranamirim. I think it is one hour south of Natal. But it is close to the coast. Which is cool because the other day we ate at a house close to the beach and saw the beach. It was beautiful and we saw surfers and dolphins. BUT I AM NOT ALLOWED TO SWIM! So that sucked. And now I am here. My companion right now Sister Rodrigues is from Cape Verde Africa. But when she was 8 she moved to Portugal. She was baptized at age 17 and has been a convert for 4 years. The only thing that is hard is that she speaks Portugal Portuguese. And it is a lot different than Brazilian Portuguese. Almost a different language. So I am learning that dialect too because some day I will go to Cape Verde and other parts of Africa and ride an elephant. We are the only sisters in my zone. And most of our area we cannot go after 5 pm because it is dangerous. My area also has fireflies, monkeys, crocodiles, SPIDERS GALOR, poisonous frogs (in the Capella too) weird worms in the bottom of my shower. and a lot more bugs that I don't even know. Now about the people that I am teaching! My favorite part! Marcos e Graça: They are so cool! Getting baptized but they have to get married first. So we are having a wedding tomorrow for them and then one Sunday they will be baptized! They are SOOO cool! Fabio: He is a rapaz of I think 20 years. But he has sooo many interesting questions. He asked me if games are a sin and then proceeded to tell me how ALL games are a sin and that after he is baptized he won't play any more games. But he doesn't want to get baptized because he wants to make sure he won't change his mind. He says all of this stuff like he is IN the world right now. That he can play games and this because he is in the world. But the missionaries are not in the world. Because we are on the straight path. He just doesn't understand the atonement. That we are all going to mess up. That we are all going to do things wrong in our lives. But that is why Jesus Christ, our loving savior, provided a way that despite our imperfections we will be able to return to the presence of God. So we are still working with him on that one! But he has a baptism date for the 30th. And we are praying that he will feel ready by then and understand the things that he needs too! Janaina: She is super cool. Was supposed to be baptized this week. But then we just barely found out she is involved in some crazy witch doctor stuff. I did not understand all of the things that her mother said but we asked Marcos and Graça about it and what I got out of it is that it is something like the creepy guy from Princess and the Frog. How he uses spirits to do bad things. Well, that is what she is doing. And every time she tries to leave this group bad things happen to her. So not really sure what we are going to do about that. I think when our elders get back they can give her a blessing. But my goodness it is creepy stuff. Oh yeah. Our elders! Elder Carvalho and Elder Shakespeare. The first morning here we got a phone call from Elder Shakespeare and he asked us to bring a Taxi to their house that Elder Carvalho needed to go to the hospital in Natal and no one knows what is wrong. Well, we ran a mile to the Taxi place and got the taxi to them. THE TAXI WAS 160 reais! MINHA NOSSA! if I have to go to the hospital I don't have that kind of money! But I guess it's okay because I won't have to go to the hospital. 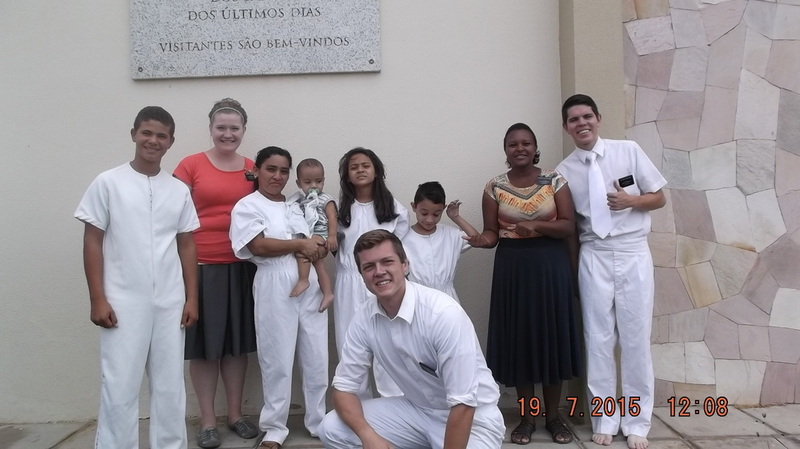 So this was last Thursday and we have been the only missionaries within a half an hour by car since then. But he is coming back today. No one knew what was wrong. But all of the interior organs in his body were inflamed. He had 2 doses of morphine and it didn't help. Whatever they did next was better. He is coming back today. Other random scary experience about listening to the Holy Ghost! We were walking home from a family night and there were 2 rapazes walking with us. I think because it is dangerous, but they didn't say that. We were walking down this little park and out of nowhere Sister Rodrigues grabbed my arm. And I was confused. So I looked at her and asked her why but she just kept talking. And out of the corner of my eye I saw a sketchy man walking really quietly REALLY close behind us. So I adjusted my purse so that it was in front of me not on the side and I kept walking close to Sister Rodrigues. And the man left. When we got home I thanked her for that because I was legitly scared of the man. And she asked what man. And I told her about the man and she said that she didn't see any man, she just felt like I was walking a little far away. I don't know that the man was going to do anything. He was probably harmless. But he was sketchy. And I am so grateful that I didn't get the chance to find out. I think that is most of this week...definitely not all. I mean I still have a story about how yesterday we walked 2 hours to get to the house of a member. And she wasn't in her house. But that was an adventure. NOSSA! But sadly I don't have time. Miss you all! Love you! And I will talk to you all next week! Well. this week was really interesting. we have transfers coming up again and I am ready for them! My goodness I didnt think that I would be! but I am! We have gone through struggles. We had one week without food. We had weeks without money. We had weeks without water in our house. And we had one week where the celing was falling down in the bathroom of our house. But that 6 weeks is over. And we are getting ready to start anew. I think the best thing this week was that we went on exchanges and I got to work with Sister Guiamarines. She is COOL! But really quiet! But we got a lot of good things done! And it was nice! And we got to meet with Alvaro who is 12 and he wants to be baptized. But his grandma will not let him. He reads the scriptures every day and is teachcing his friends about the gospel. one of his friends and family of his friend are going to be baptized becasue of the influence that he has with them. And he prays every day that his mom and his grandma will let him be baptized but as of right now his grandma is a galero. Pray gor him every day! One day he will be baptized! I know this! Still no camera. But we went to Caicó again. It was fun! I realized that EVERYTHING is cheaper there than here. My area is the most expensive in the mission. I sware! But its chill! So a little more time here. Well I have been pretty TRUNKY this week becasue in one year and a couple days I will be back in my house. Gee time has flown sooo fast. I mean I still have a year but I also have almost 6 months under my belt. I think that is so weird because I am still in my training...Which sometimes I think was a bad thing that I had to start over with that when I came to Brazil. But hey, I still have a whole year! :D That is lots of time to do lots of things! This week was another strange week. But I think all of my weeks are strange. I mean I wake up in Brazil everyday...so. BUT the weird stuff first. I have had weird dreams that I dont remember but one night I was REALLY mad in my dream and when I woke up I was REALLY mad for no reason...which was sad becasue I did not understand and then last night I had one of those dreams where you are falling and then you jerk awake. Well I almost fell out of my hammick when I woke up. So if you have any advice on how to fix bad dreams...or just weird dreams please let me know. Becasue missionary life without sleep is HORRIBLE! We also had lots of apointments and firm investigators that DROPED this week. And I realized a couple things. One is that when the church is starting out everything is fragile. But it is a lot different than in my city where it has been there for YEARS. I have learned that everyone makes mistakes. But none of us are perfect. This is the church of Jesus Christ. Not the church of the bishop, the missionaries, the gospel doctrine teacher. And leaders will make mistakes. Sometimes small and other times grande. But that is why we have the atonement of Jesus Christ. It is for me just as much as for the president of our stake and the people that I am teaching. It is for everyone. And the only time that is too late is tomorrow. Because if we keep putting it off we will never get anywhere. I was able to see this in my ward yesterday. We had a meeting and I dont remember what was said. I dont remember pretty much anything. But it was a beginning of something great in Currais Novos. The leaders were working together to build the church here. And I am so excited to pass another transfer here. I am praying every day to pass another transfer here. And although we did not have any investigators in the church. And we really dont have and firm investigators right now. I was able to spend this hour with the Parque Dourado Ramo and help them grow closer. And then I spent the rest of the week BAWLING becasue everyone else dropped us. Still dont have a camera but I am headed to Caicó this week to look for someone to fix it. But it is really sad becasue right now the moon is SO beautiful at night. BUT there was a really cool story shared about hymns in sacrament meeting yesterday. A single mother when she was a child remembered singing I am a Child of God with other people in the ward. Doing what I think was a little primary program. And when she had her son she would sing this song to him. But then she went through a lot of hard times. And when her son was able to talk he started singing I am a Child of God to his mother. Now he is only 4 or 5. But they are back coming to chuch and she bore a strong testimony of the Spirit of Hymns. And the importance of singing them. MIss you all! Love you a bunch! Wow. This is already the last week in July! Where has the time gone? This week was not really exciting. I actually dont know what happened to this week. It started off with last weeks p-day. And somehow we made it here. I think it is because there is a big party going on here in Curris Novos. For the whole week we had loud music in the street and fireworks going off until 5 in the morning. Right next to our apartment. So we did not get ANY SLEEP this week. But we made a record in Natal history with baptisms in the interior. We had 145 baptisms this month. And I am praying every day that they will remain firm in the gospel! Love being a missionary! I will never give this up for anything in my life! Gee, I think this week went on forever! BUT we had 3 baptisms this week and the Elders in the same Ramo had one. Fui bom. Rosinede and her family. She is awesome. And has a great story. Kind of. So last Saturday like 7 pm me and sister Castillo were looking for people to come to church. We needed I think 2 more. But had no one so we were inviting people right and left. or some reason this is the hardest part. Getting people to come to church. But we saw Rosinede outside a house with her baby Marcos and we stopped and talked to her. I don't remember what we talked about, but I remember we asked for her address and she said she lived really far away and that it would be hard to find her. Well, the next morning we found her and picked her up for church. It was great. Her daughter and both ber sons came too. Then over the week we taught her the lessons and she had a date to be baptized with her children. Then Saturday we went over to her house to fill out some papers for their baptisms and Rosinede was super stressed because Marcos her 1 1/2-year-old was in the hospital 2 times the night before vomiting and they did tests, but no one knew what was wrong. HE was screaming and crying while we were there. We offered to call the elders to give him a blessing, but she said no. So we told her we could come back later that night to do the papers so she could take care of Marcos. When we came back he was no better. He was making sounds like there was something in his throat, but I checked (so greatful for my lifeguard training) But there was nothing. So we called the elders. Elder Mauter and Elder Ifran. The came over and when they put their hands on Marcos´ head the hands of elder mauter engulfed the head of marcos. And he cried during the blessing and until the elders left. But after he was fine. He was a different baby. and the next morning during the baptisms he was just fine. I have a stronger testimony in the power of priestood blessings! I know that Satin was working hard with this family. But I am so greatful that we can call upon our elders to excesize the Authority given to them to bless the lives of people here. There is a scripture in 2nd Nephi. More or less it says God is the same yesterday today and forever. But he only works miracles umong the children of men according to thier faith. I know that because of the faith of those two elders. The faith of Rosinede and her family. And the faith of me and Sister Castilho Marcos is better. I am so greatful for this! Other than this BIG event in my week most everything was normal. I made chocolate chip cookies (coulpa de meu pai) And they actually turned out great. Until the last batch. I put it in around 11:30 pm. I know fubeca, but I needed to cook them for Rosinede and her families baptism. Then I squatted on the floor because I am a germaphobe here. And then fell asleep. I woke up at 1:03 and opened the oven, then shut it and turned off the oven and went to bed. Here is a picture of what happened....haha! 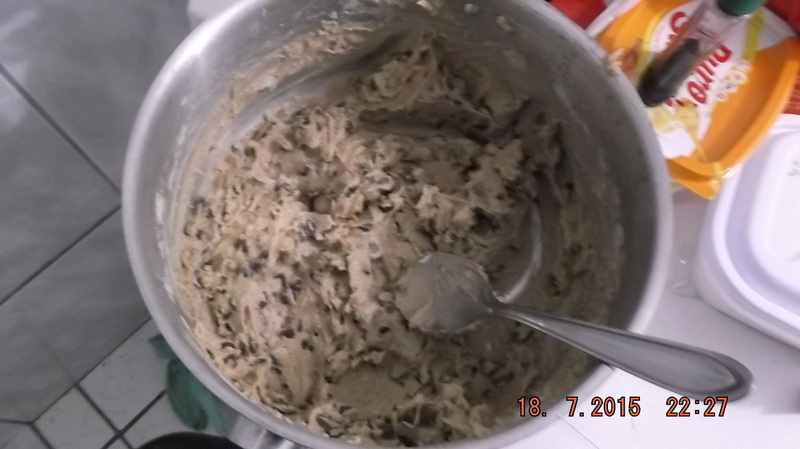 BUT I made some good cookies! :D And now I am going to bribe the elders to carry a box of Book of Mormons from their house to our house and I will give them the rest of the cookies :D WHOOT WHOOT! LOVE MY ELDERS! Woke up this morning sick. But I know it will get better. always does. I know what everyone (Brady) meant by he got sick a lot. And also what Brother Dance meant by you just get used to the blood marked on your sheets from the mosquitos. Things are just becoming normal. Which I don't know if it is good. But for right now it is. Also NEVER in my life thought I would be cold in Brazil. But I have been FREEZING these last couple of days. it has been cold. LOVE YOU ALL! MISS YOU A TON! So this week we had A LOT OF THINGS HAPPEN! But I just want to start out with a story that started a couple of weeks ago. And thank you for all of your prayers. So Irmão Fransisco (I don't remember the code name) But he is the one whose daughters ran away. We had a family night at his house and his sons were home. But there is more. In the middle of the Spiritual thought both of his daughters returned home as well. They are safe and home. Thank you so much for all of your prayers! This is more or less what happened. They ran away. But did not have enough money. So they were on the bus where the girls went missing. But then they got half way to natal and got kicked off because they didn't have money. Which was a great blessing. And then somehow they made it to their moms house (because their parents are divorced) But did not talk to their dad. Until Thursday night, they showed up at their dad's house. ( they ran away about a month ago So this was the first time in a month that he had seen his daughters) I almost cried. The oldest of his daughters is the same age as my youngest sister Sammie. This morning we climbed a rock with the cross on the top. It was really high but TOTALLY worth it. 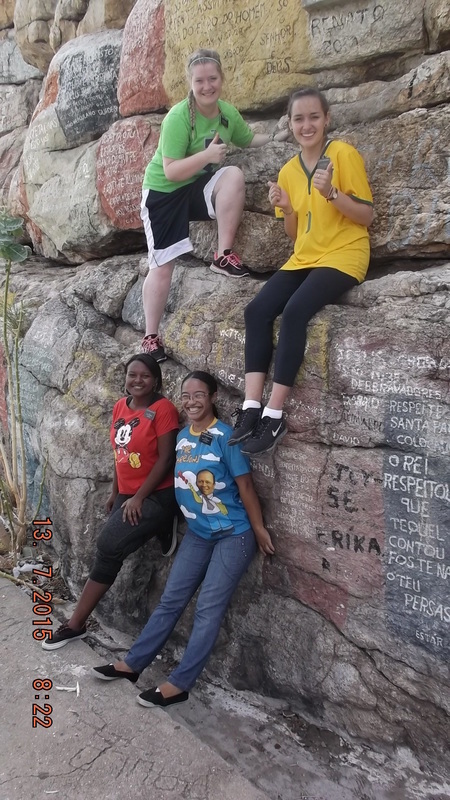 Just the elders and me and sister Hernandez climbed to the top. There was one moment when I was trying to get down when I was not touching any rock. I was just holding the hand of elder Ifran. He thankfully helped me and Sister Hernandez get down :) AND I have pictures as proof! It was legal! I want to do it again someday! Another weird thing that I heard on the radio cars was this church was requiring people to pay 110 reais to be baptized! WHAT! NO WAY! Freak! I think that is crazy! And FINALLY! I just want to give the BIGGEST SHOUT OUT TO THE....da da da da! THE BEST MISSION IN THE WORLD! NEVADA LAS VEGAS! Don't get me wrong I love Brazil! But the last week I have really missed my mission in NEVADA LAS VEGAS! (Even my companion misses that mission and she has never even been to the US let alone Las Vegas Mission) But This is why I miss Las Vegas! 1. PRESIDENT AND SISTER SNOW! President Snow would ALWAYS RESPOND to my emails. And If I had a question it was answered if not on P-Day it was answered by Tuesday! And Sister Snow was so close! I could talk to her and there was one day when she took our zone out to lunch! SO AWESOME! 2. I had the BEST TRAINER IN THE WORLD! I learned so much from Sister Morceli! She is literally the best there is! MISS HER! 4. The Nevada LAs Vegas Mission is ORGANIZED! Down to the maps and the areas! 5. BECAUSE I LOVE LAS VEGAS! THE PEOPLE ARE AWESOME! There is my little shout out! Just remember this! I will return many times to LAs Vegas! Brazil também, but Las Vegas is easier! So I got really carried away with responding to people today. Sorry this is going to be a short email. Met a really cool family that i 7th Day advantists. This is really hard becasue they have the bible memorized! For real! But after the first lesson the mother told us that normally they do not open their house to missionaries because they are taught that in church because they do not want members of their church to change religions. but I taught them about the Holy Ghost and my companion said that she almost cried and that the mother did too. Which is weird because I do not remember what I said. One of the members in the ward, Duiji, served his mission in Colorado and we went over to his house and ate American food! BEST food I have eaten here yet! Hamburgers and apple pie! the pie was in the shape of the American Flag! it was legit! I have pictures! And our water is back! is was silly. somehow the water switch that is on our roof was shut off. Soooo... dont know how that happened. But that happened....we got it back on now :) AND I AM CLEAN AGAIN...well as clean as I can be in Brazil. I cannot wait for a shower in my own home! And we had a party with a 3-year-old! It was his birthday and his mom is a recent convert! João! He is so cute! And next awesome thing is that I got my eyebrows done. But here they do not wax which is weird. But she did them by hand with tweezers. it hurt really bad but hey, Grandma B would be proud of me that I actually did it :) Or at least I hope she is :P HAHA! And on top of that a recent convert in my ward gave me some BRIGHT pink lipstick! So I will take a picture and add it to my next week email! BATOM ROSA! Miss you all! Love Ya! Well, I am almost to the 4-month mark. But I still have eternity left. And this week is transfers. But I know that me and my comp are going to stay here. I am not sure if that is a good thing or a bad thing. but we are going to make it a good thing. My week was pretty normal. We meet people and set up appointments and they are not there. Or they are really catholic and don't want to listen. Or they have other reasons. But yesterday we met a man who seemed open and said that he was going to church, but he never showed up. We waited 30 mins for him and he never came. It was really sad, but we will go visit him today. It is really hard to find the elect, but we are going to keep looking. We did have a weird experience with one of our families. They have been together since they were 16 and are really cute together. Now they are almost 80. We asked them to get baptized, but the husband was always so hesitant. He said things like he didn't know enough and he didn't feel ready. His wife PRAYED EVERY NIGHT that he would be ready the next Sunday because she is ready. She even cried with us because she wants to get baptized with her husband, but he keeps telling her not this Sunday, not this Sunday. Well, then we asked our district leader to give him the interview because we thought he was ready. AND we find out that his wife thinks that he is cheating on her because he leaves the house at weird hours and has no explanation. And we find out that he has another mulher. He has a girlfriend. HE IS ALMOST 80 YEARS OLD! I am not really sure what to do. Elder Cragun set some goals with him and as soon as he leaves his girlfriend he can be baptized. But his wife will not get baptized without him. This is such a weird sticky situation. Sometimes I ask myself am I on my mission or am I in a telenovela? Miss you all a whole bunch! HAPPY BIRTHDAY DAD! When I get home we will have a HUGE birthday for you! SO many fireworks and fun! I can't believe that I will miss 2 4th of Julys! SO SAD!